"Cool, creamy, and spicy. Crazy good salad dressing you could also use as a dip. This recipe is a lot like the dip they serve at Chuy's, which is a restaurant we have in Texas." Place tomatillos, cilantro, and jalapenos in a food processor or blender. Blend until smooth and set aside. 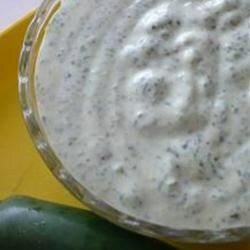 Combine the sour cream and ranch dressing mix in a medium bowl. Whisk in about 3/4 of the green sauce; taste and adjust the heat level by adding more green sauce. This recipe is yummy! I don't think it doesn't taste like Chuy's jalapeno ranch, but it is still really good in it own way. It is good by itself or add salsa and cheese on top for a dip. This recipe for salad dressing tasted very good and I know I will make it again. Thank you for a great recipe. This is yummy, but not quite Chuy's to me. I did some adjusting and came up with a recipe that I think is even closer to Chuy's deliciousness.